What's better Apple iPad Pro 9.7 or Microsoft Surface? To answer this question SpecsPRO has compared Apple iPad Pro 9.7 vs Microsoft Surface: screen resolution, camera, battery and other important specifications. The Microsoft Surface is equipped with a more powerful processor Dual-core 2.16 GHz (Twister) in compare to the iPad Pro 9.7. It is an significant difference between these models because a fast CPU guarantees that this model is a better choice for user who wants to play more games without lags. The iPad Pro 9.7 runs a better graphics processor PowerVR Series 7 (12-core graphics) which will allow the user to run more new games. The iPad Pro 9.7 runs more RAM (2 GB) which means that this model shows higher performance in comparison to the Microsoft Surface. The iPad Pro 9.7 has 2K HD (1536 x 2048 pixels) display resolution with 263 ppi pixel density which is better than the Microsoft Surface HD (1366 x 768 pixels) resolution with 147 ppi pixel density. Such display resolution means that this tablet is the best buy for browsing the web. If you are a photo lover then the iPad Pro 9.7 is a better choice for you because this model is produced with more quality back 5-Megapixel camera with 2.2 aperture. The iPad Pro 9.7 captures videos with a higher resolution: 4K UHD vs HD. The Surface smartphone is produced with a card slot. This is a pleasant advantage: you can easily expand internal storage and transfer files. The iPad Pro 9.7 weighs 437g that is 243g less than the weight of the Microsoft Surface. The iPad Pro 9.7 has 12 advantages and the Microsoft Surface only 2 so the iPad Pro 9.7 will become the best choice. Check the list of the best offers on Amazon . Apple iPad Pro 9.7 and Microsoft Surface comparison helps to understand what tablet is the best purchase. Use the list of the offers on the page of the device you prefer to find where it is cheaper to buy this tablet PC . 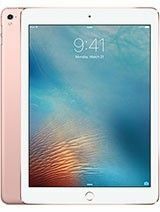 Besides Microsoft Surface to Apple iPad Pro 9.7 compare specs of other tablets easily.